Just this past weekend, violence erupted at the Nevada Democratic Delegation committee, sparking fear amongst the powers that be. Prediction #5 from my May Predictions list has to do with the contested Democratic primary that is coming to Philadelphia in July. Many see this as a sign of things to come and they are very likely right on that assessment. I have hinted at this outcome for many months now and have been given early warning signs from the spiritual world for over two years. From my blog post on Philadelphia in 2014 to my most recent predictions on the presidential election, I knew that something was going to happen that would provoke revolutionary overthrow. This seems to be it. Philly has been spared from violence so far. They avoided the dreaded Pope Francis assassination, though his life was greatly at risk. With comparisons to the 1960’s more apparent by the day, a 1968 Chicago like melee in Philadelphia may be coming from a split between Bernie Sanders and Hillary Clinton and fulfill much of the doom and gloom that I have foreseen for the city over the years. As the dreams of a contested GOP convention die, the energy sent by the powers that be towards Donald Trump is being directed at another target instead; Hillary Clinton. What many commentators insisted would be the destruction of the Republican party may very well be the end of the Democratic movement in our country instead. There’s no real way to stop Trump at this stage in the game. Republicans have no time to organize a challenge to him this late in the game. Meanwhile, liberals and left wing activists have both the continued primary of Sanders and a general election candidate in Jill Stein of the Green Party to contend with to rebuke Clinton’s unfair rigging of this election. Despite what the majority of psychics are saying at this time, a Clinton victory is far from guaranteed. Those who know history know she isn’t likely to win if the devil has his say in the matter. She may be evil, but she may not be quite evil enough for the liking of Hades. If this Vegas brawl showcases anything, it’s that my worst fears may be realized before our very eyes. I hope this wakes people up to the dangers of big government and high stakes elections having such prominence in this country. Otherwise, my more positive visions for the future may be taking a temporary detour in a far right, fascist direction. Something I’ve noticed in recent months is that our time is most like the 1960’s. While history doesn’t directly repeat itself, it rhymes. The mass movements for gay rights, women’s rights, civil rights and economic justice have all been playing out in a way that was similar to the 1960’s. Starting with Occupy Wall Street in 2011 and continuing on into the Black Lives Matter movement in 2012, the decade has seen mass movements being met with mixed success; most of it blunted by the powers that be. 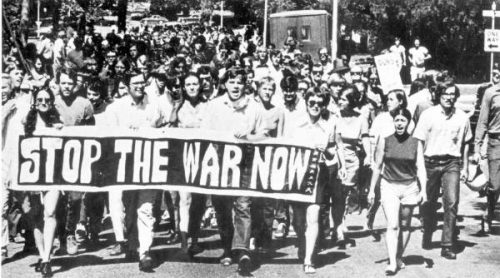 The only thing missing to correlate our decade with the decade of fifty years ago is a massive anti-war movement against US imperialism around the globe. That may be coming soon with Obama’s escalation of military tactics in the South China sea and with his threats to escalate tensions against the Russian government. If violence begins by either side and turns into a military conflict, then you can expect a Vietnam like protest movement to arise across the United States all over again. Mass demonstrations will be met with the usual state violence and the threats of a draft come and go with too much opposition to it in the form of mass public opinion. The parallels of our time and then will be complete at that time; hopefully with a successful governmental overthrow accompanying it. Regardless of the outcome, it will be unlike any anti-war movement history has ever seen before. It will be one the elite’s will remember for generations to come. Well, I haven’t done one of these in a while and figured I should do one now. These are some of the predictions I have written that have already been fulfilled at this time. In the middle of 2012, I wrote in a post on the original Know the Next website that times of economic uncertainty would see more jail riots and prison break outs than in normal times (I couldn’t salvage the original post, it seems to be lost forever). Much of this prediction fell around a failed (or thwarted, depending on your interpretation) prison break out at the embattled Rikers Island for the year 2013 or 2014. Much of the original prediction didn’t happen at Rikers as I said it would because reform began there, Cecily McMillan was freed before she could cause a riot and attention was being paid to the facility by the powers that be that thwarted this potential prediction. 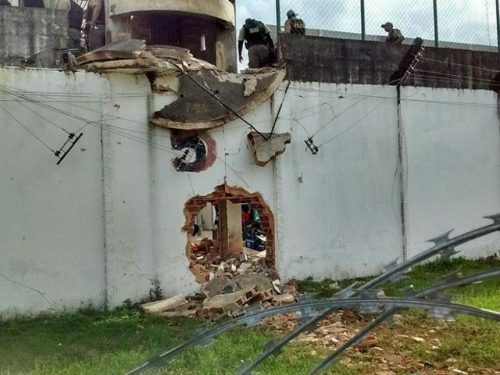 Despite this, however, there were other break outs during this time throughout the country; including the infamous one at the Clinton Correctional Facility in Dannemora, New York. In addition, a riot broke out around the original prediction vector at Rikers and strikes and riots occurred in other cities instead. What troubles me about this vision, and why I am writing an update for this now, is because the trouble I had foreseen at the time still lingers. There are more mass prison strikes than in any other point in our history. There are also more riots and attempted break outs as well. It seems that, instead of the usual breakout once every four or five years or so, a break out happens several times a year; a major fulfillment for where I said this would be the case. This tends to happen in times of economic uncertainty and there have been more consecutive break outs over the last three years since I wrote the original prediction than at any other time in history. In addition, Rikers could still see a massive prison lockdown and breakout if the plans to reform the prison fail; as they very much have the potential to fall apart. It remains to be seen if this is a thwarted prediction or a fulfilled one with a massive delay of a number of years. I’ve warned that my dating can be inaccurate in the past. If it happens years later, I’m still calling this a prediction fulfilled. For the last four years, the economy has been sugarcoated by a rallying stock market. Reality and the fed inflated asset bubble haven’t correlated with reality since then. I’ve been wrong about previous stock market crash predictions because of deliberate interference by the US government to preventing this outcome. It’s already been proven on at least two occasions that major correctional downturns in the US have been averted by further Federal Reserve interference and a furthering of the stock market bubble. The China bubble burst in August of 2015 was interfered by the Chinese and US governments as well. They wouldn’t be working so hard to prevent this inevitability if they thought they could survive another crash. They know, as do I, that the next market crash will wallop them both economically and politically. They are going to hold it off until it is physically impossible to do so. This means that my ability to gauge a specific vector is nearly impossible unless I’m psychically willing to use my ability of vibrational radiation to force a crash on them sooner. 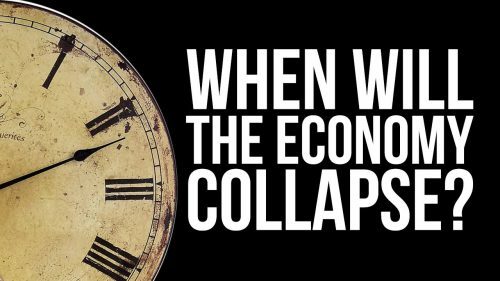 We’re on the verge of collapse already, but it may not happen for a while unless forces work towards having it occur earlier than expected. It’s not a matter of if the stock market is going to crash at this point, but when it will happen that continues to be an impediment towards my intuitive accuracy. A housing bubble burst imminent and other problems follow suit. Despite numerous delays by the powers that be, the revolution against them is imminent. If the increasingly unpopular Clinton vs Trump matchup doesn’t flare it up, then nothing ever will. I’m confident that the collective hasn’t shirked their responsibility. They just need to find the will to go forth for their freedom. As I’ve stated many times before, the European Union is a doomed project. Every week it seems that more news arrises that indicates its imminent falling apart. A Brexit, UK exit from the EU, is more likely than ever; even with the unpopular Obama making the case to the contrary. A Grexit vector is coming up yet again a year later from my initial prediction. 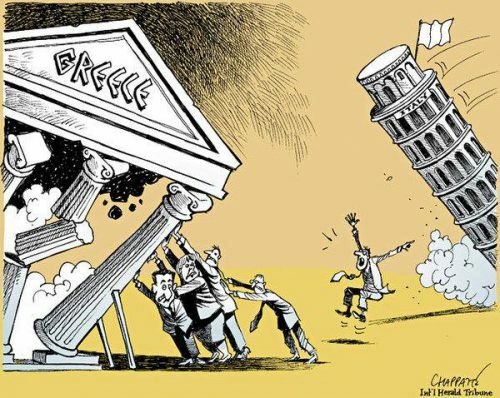 With unrest in the streets after another round of austerity and the threat of default lingering again this June, Tsipras or his successor may be forced to exit the currency and do what they should have done years before. Sometimes my dating can be off; a point I’ve admitted numerous times in the past. If Grexit occurs in 2016 rather than 2015, my prescience was valid even if the dating was off. Since last year the migrant crisis has been worsening things and economic collapse and/or World War 3 are the last straws towards disintegration of the EU project. It won’t come back together again even as the monarchy likely reigns in the follow up to war. It’s also a no win for situation the Europeans; sad as it is to say. Too much bad karma has built up and it’s going to take centuries to expunge its energy from within its midst. I thought the Europeans would be given a final chance to redeem themselves, but they have failed miserably. Bad things are ahead for the European nations; most of which will last for one hundred years or more. The tipping point in Israel’s ability to avoid accountability has been reached over the last year. The world is turning against them and cracks are beginning to show in the most supportive country and ally; the United States. The more aggressive the actions are against the Palestinians and political dissent generally, the more those cracks laid out by Bernie Sanders in his debate against Hillary Clinton and by Donald Trump turn into dams on both sides of the political aisle. A renewed military deal with Obama is coming because the Israeli elite fear (rightfully so) where the political winds are turning and no amount of bribery of elected officials is going to change that fact. It makes no difference either way as destruction is imminent unless they change their entire political structure. They’ve had ample opportunity to do so and time is running out. It’s now or never; though I suspect their arrogance will lead to never. I’ve predicted what’s to come to Israel. 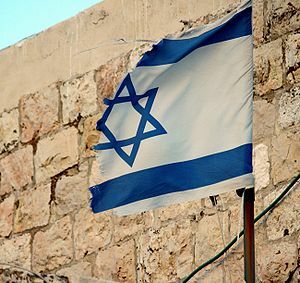 By 2018, Israel as an exclusively Jewish state may be no longer; sad as it is to say. Finally, much of my warnings on North Korea are already beginning to reveal themselves this year. 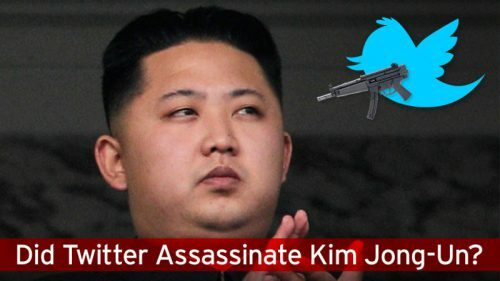 Kim Jong Un’s assassination is already being prepared for. A major editorial I read recently lays out, almost word for word, my prediction from years earlier on the topic. It’s happening this year which would be a fulfillment of my original dating vector. My estimate for this event is the end of May or early June; though it could be later than that. It doesn’t matter how much Un tries to appease the international powers. When they want someone gone, they almost always go. It all comes down to a prepared war between China and the West; with Asian nations serving as proxies of both states. The Trans Pacific Partnership, a deal designed to weaken the powers of the average person, is largely being sold in military circles as being a pivot to Asia. With these aggressive tactics in order, the region will be rocked and China’s overthrow commences into 2018. It starts as a lead war by the west in the aftermath of the destabilization of North Korea, but the US’ own instability means the pieces are picked up by China’s neighbors. What causes the downfall of China will also cause the downfall in the west at the same time. As I’ve said before, in this war there are no winners, only losers. The people will be the only ones that benefit long term, but for the immediate future, much suffering commences. I’ll have some more things to share in the near future. Keep an eye out for them at that time. Best wishes to you all as always. I had an overwhelming thought the other day that is worth sharing for the beginning of my predictions for May of 2016. More will follow below in an update. 1) I kept hearing the name Shemeem Abbas in my head over and over again and that she is in great danger. When I searched for her name online, I had read that an attorney she was affiliated with was murdered in 2014; potentially by the Pakistani government for defending someone accused of blaspheming the Islamic religion. If these correlations are any indication, then it means that her life in immediate danger and she should seek safety as soon as possible. There was already a gun man scare on the campus she works with just last month. If she’s not careful, then she’ll end up being assassinated by Pakistani spies in the very near future. Hope she gets this message as her life depends on it. 5/2 ETA: Two more predictions for you. 2) I’ve been posting a lot of doom and gloom messages lately, but I have some good news to offer. The workers on the picket line will win against Verizon as their company’s intention to disrupt and destroy the union, rather than negotiate in good faith, is exposed for commercial purposes. This forces Lowel McAdam into resignation and a new CEO comes up in the ranks who is willing to come to the bargaining table and agree to a fair termination of the contractual agreement of wireless workers by melding them into new union contracts and offering relief from traveling long distances and having their jobs shipped overseas. Though it may not make every worker feel like they made a difference, in the long run, the significant victory will help the long term viability of the labor movement in the United States. 5/13 ETA: Some more visions and predictions. 5) Many people thought that the Democrats would have an easy way to the White House and that the Republicans would have a contested convention. Unfortunately, the opposite has been occurring; largely due to the devil’s influence in elevating Donald Trump to a position of authority. With the last great hope for the party resigned to supporting the frontrunner, the Democrats are the only place left for a Trump defeat; and it won’t be on Hillary’s watch. I am still convinced that the internal fight between the FBI and the Department of Justice is so severe on Clinton’s email scandal that it will drag her candidacy down and force her to resign during a contested convention. It may not happen, but there is a lot of anger on the left side of the aisle and Bernie is pushing for it as his last great hurrah in electoral politics. Win or lose, a Republican contested convention isn’t going to happen. Rather, a Democratic one will happen instead. How it plays out, I can’t say for certain. All of that remains to be seen. 6) I’ve written about tensions in New York and how the city will light up into flames soon. I’m expecting it any day now as the underlying tensions are boiling over and will soon spill out into a way that cannot be hidden. 7) Finally, I foresee a scandal for Stephen Spielberg in the near future. The allegations will be so severe that it will blunt his career and achievements forever. 8) The new Prime Minister of Brazil will likely be assassinated within the next sixty to ninety days. This will infuriate the US which helped to install him and further create instability throughout the South American continent.